The winter time weather variability over the Mediterranean is studied in relation to the prevailing weather regimes (WRs) over the region. Using daily geopotential heights at 700 hPa from the ECMWF ERA40 Reanalysis Project and Cluster Analysis, four WRs are identified, in increasing order of frequency of occurrence, as cyclonic (22.0 %), zonal (24.8 %), meridional (25.2 %) and anticyclonic (28.0 %). The surface climate, cloud distribution and radiation patterns associated with these winter WRs are deduced from satellite (ISCCP) and other observational (E-OBS, ERA40) datasets. The LMDz atmosphere–ocean regional climate model is able to simulate successfully the same four Mediterranean weather regimes and reproduce the associated surface and atmospheric conditions for the present climate (1961–1990). 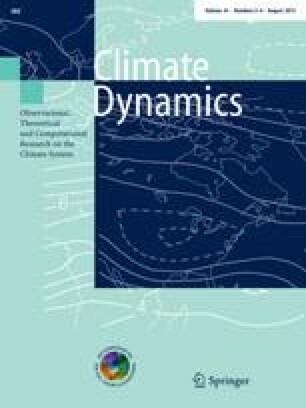 Both observational- and LMDz-based computations show that the four Mediterranean weather regimes control the region’s weather and climate conditions during winter, exhibiting significant differences between them as for temperature, precipitation, cloudiness and radiation distributions within the region. Projections (2021–2050) of the winter Mediterranean weather and climate are obtained using the LMDz model and analysed in relation to the simulated changes in the four WRs. According to the SRES A1B emission scenario, a significant warming (between 2 and 4 °C) is projected to occur in the region, along with a precipitation decrease by 10–20 % in southern Europe, Mediterranean Sea and North Africa, against a 10 % precipitation increase in northern European areas. The projected changes in temperature and precipitation in the Mediterranean are explained by the model-predicted changes in the frequency of occurrence as well as in the intra-seasonal variability of the regional weather regimes. The anticyclonic configuration is projected to become more recurrent, contributing to the decreased precipitation over most of the basin, while the cyclonic and zonal ones become more sporadic, resulting in more days with below normal precipitation over most of the basin, and on the eastern part of the region, respectively. The changes in frequency and intra-seasonal variability highlights the usefulness of dynamics versus statistical downscaling techniques for climate change studies. The online version of this article (doi: 10.1007/s00382-013-1823-8) contains supplementary material, which is available to authorized users. Support by the European Union Integrated Project -036961, Climate Change and Impact Research: the Mediterranean Environment (CIRCE) is acknowledged. This work was partly supported by the French ANR project REMEMBER (ANR-12-SENV-0001).